In short: Copy the .lua file from github here to your transmitters Apps-folder, if there is a translation file copy the .jsn file to Apps/Lang-folder on your transmitter. Head on to “Applications” -> “User applications” and add the app. Guide on installation of Lua-apps available here if you need some more in-depth guide. If you want you can give battery a name, for example “RX-Battery” or “Turbine Battery”. 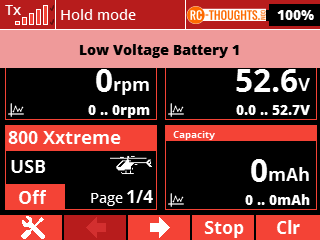 Then select the voltage-sensor you want to use for each battery. If you are using different announcements already you can adjust the announcement-time. The value means “how many seconds after alarm the voice announcement is made”. Alarm value is the voltage limit. For example for 2S battery this could be put to 8.2 volts (4.1V per cell), after connecting a 2S battery with 8.2 volts or under is then considered as not fully charged and creates an alarm. 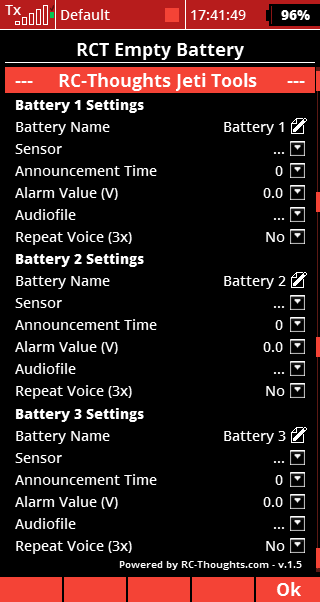 After selecting the audiofile to be played on alarm you can choose to have the announcement repeated 3 times. After this your all done. It really is that easy. Finally a really easy way to do a complicated task!